Ptosis repair is a form of a lid lift whereby the eyelid elevating muscle is shortened and re-secured to open the eyelids. This is different from blepharoplasty (another form of lid lift) surgery when skin/muscle and fat of the eyelid is removed without touching the elevating muscle. This is an important distinction about lid lift surgery. Blepharoplasty is a relatively straightforward surgery, while ptosis repair is much more complex. For this reason only an eyelid surgery expert (an oculoplastic or ophthalmic plastic surgeon) should perform the ptosis repair form of lid lift surgery. 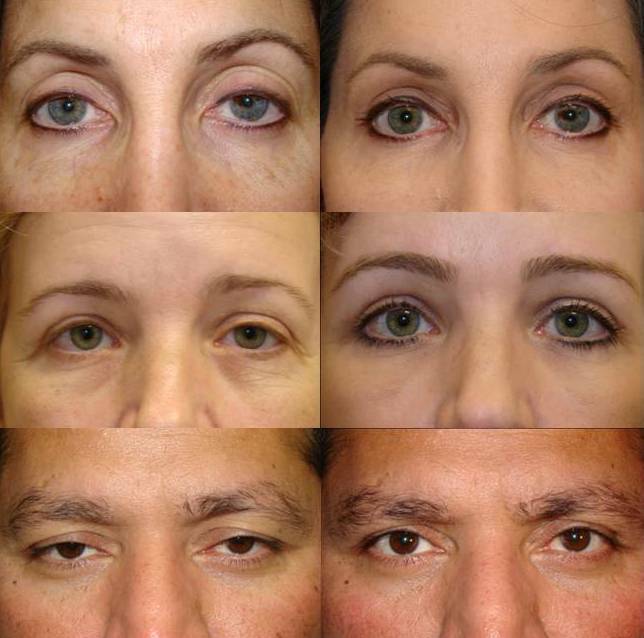 Below are three examples of patients who had ptosis repair (lid lift) performed by Dr. Massry. The before lid lift (ptosis repair) surgery pictures are on the left and the after lid lift (ptosis repair) surgery pictures are on the right.